Often, when you think about touring Israel, you probably think about visiting many of the unique and historical sites located in and around Jerusalem. But the country of Israel has so much more to offer for many individuals. 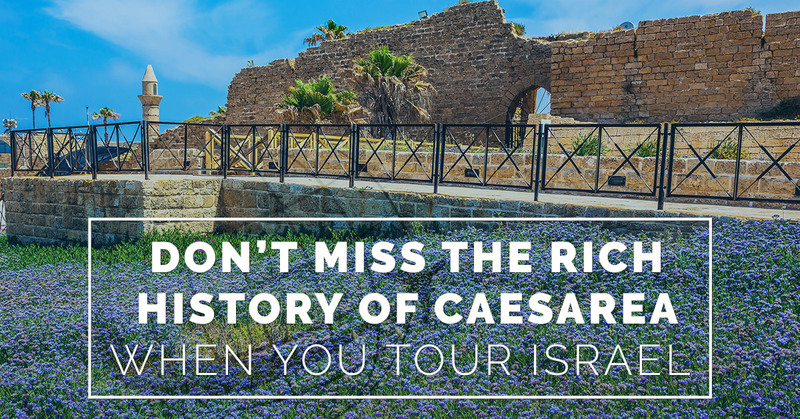 Whether you’re a history buff or you’re looking to explore the rich religious history of the region, the city of Caesarea is one you simply cannot miss when you visit Israel. Every tour of Israel should include a visit to this incredible city that has well-preserved ruins dating back to Roman times. To learn more about what you will find on your visit, keep reading. When it comes to Roman port cities, you probably quickly think of Pompeii and the incredible archaeological significance that the city holds. However, Caesarea is an archeological wonder of the world in its own right. The area in and around Caesarea was originally settled prior to the main city’s construction. However, around 20 BCE, Herod the Great rebuilt and enlarged the city under the direction of Caesar Augustus, for whom the city is named. The Romans made Caesarea a main port and the administrative city of Palestine. To this day, many of the ruins from this once thriving city still stand and give us a picture of everyday life in this area during Roman rule. When you tour this part of Israel, there are a couple sites you simply don’t want to miss. The Aqueduct System: Aqueducts were the best, and honestly, the only, way to get fresh spring water into a thriving Roman city. The aqueduct system in Caesarea can still be seen and is one of the best examples of the engineering and construction from this time period. These aqueducts ran almost 10 kilometers all the way to the base of Mt. Carmel in order to bring fresh spring water into the city, where it would be piped to public fountains and pools. The Roman Theater: The theater, still present in Caesarea, could seat over 20,000 people and was built in an incredible location. Events would be held and while watching events, spectators could also look out over the Mediterranean. This theater is exceptionally well-preserved and was the first to be commissioned by Herod during his reign. When the theater was excavated, a tablet mentioning Pontius Pilate was discovered and remains one of the few artifacts from that time period that dates him to the time of Jesus. The Harbor: If you love archeology and history, you can’t miss seeing the harbor. The harbor of Caesarea is a feat of engineering that could not be rivaled at the time. In fact, Herod was the first to create a port away from a natural marina and use a manmade system to protect the port and ships within it in the region. Two huge breakwaters were constructed in the open sea from cement and then filled with rubble in order to protect the port. The port lasted and thrived into the Byzantine era. Along with being a city full of historical interest, the ancient city of Caesarea was also one of religious significance for several Biblical faiths. For Judaism, Caesarea is thought to be the start of the Jewish revolt against Rome that started around 66 CE. This revolt later lead to the Roman destruction of Jerusalem at the time and the destruction of the Temple. Later on, from 132 to 135 CE, the Bar Kokhba revolt lead to the execution of 10 leads of the Palestinian Jewry by the Romans. These leaders are still honored today through the liturgy for Yom Kippur. Along with having great significance to the Jewish community, Caesarea also holds great significance to the Christian faith. Caesarea is thought to be the very city where Pontius Pilate governed during the life of Jesus. There are also several biblical stories directly referencing Caesarea in relation to the Apostles Peter and Phillip, but especially Paul. It was in this city where Paul would set out on journeys to preach and it was also here where Paul was eventually taken captive and help prisoner for two years before being taken to Rome to stand trial. No trip to Israel is complete without a stay in Caesarea. Let the professional tour guides with World Express Travel take you through this marvel and provide you with an experience unlike any other. Contact World Express Travel for more information on itineraries and to get started booking your trip today!